The hard work stems from the fact that the course is new and has no set text. We need to read the study design and turn it into a series of tasks for the students. Remember that many of these concepts are traditionally left till the 2nd or 3rd year of a computer science course, yet we're teaching them to high school students. The main source of help has been an online forum where we teachers share resources and the weekly video conferences we have with the university staff who have written the course. There is also a website that is gradually being populated with notes and media files. This is clearly not my handwriting. The maze was drawn by my highly intelligent chicken. As you can see, we have used co-ordinates to identify each cell. 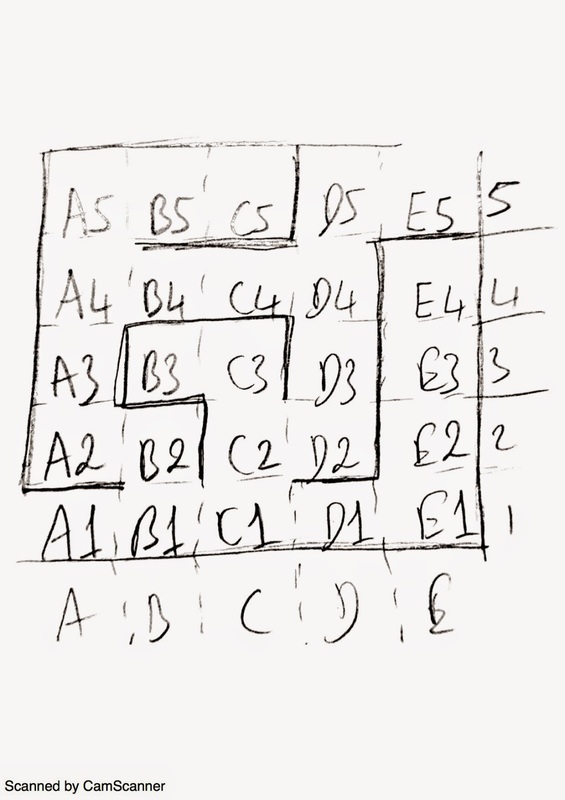 The following is a representation of the maze where the cells are represented as nodes and the edges (links) between each pair of nodes means that they are adjacent (we can move from one cell to the next). 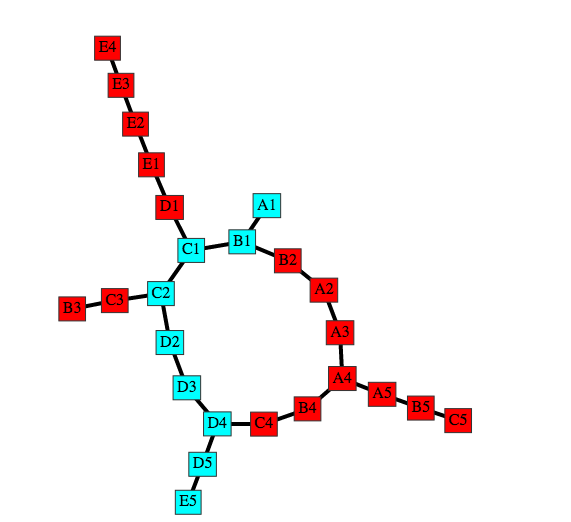 The nodes in blue represent the path from the entrance of our maze, cell A1, to the exit, cell E5. If you have implemented DFS before, you may be overly impressed that year eleven and twelve students were capable of implementing it. It is true that my students are impressive but, this early on, I gave them a program to modify. All in all, the course is proceeding well. We're all working hard and we're finding the content interesting. As the students told me in a survey this subject is "challenging in a good way". I just realised that the solution in the image above comes from a Breadth First Search which we actually implemented by way of comparison.